I am envious. 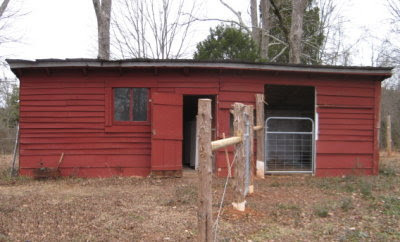 My "barn" is a 3-walled shelter, just 8 x 16 (it was originally 8 x 8 but I cut it in half and added an extra 8' in the middle. I can easily fit 4 lambing jugs into it (6 in a pinch), and my sheep are bigger than the dairy goats. I'm still trying to figure out a milking parlor. Milking in the great outdoors is fine for right now (nice weather and only 1 doe), but it won't work in a few months or when I have multiple goats to do. Dan wants a working vacation out west, right? I had a friend that was milking a large herd of goats, her barn was divided into 3 sections, 1/2 loafing area with acess from outside, 1/4 was kidding area or could be hay storage if needed. And then 1/4 was milk room. She had a platform with stanchions that could hold 4 goats at a time, at the end of the stanchion was a "goatie door" so when goats were done being milked they were all realease out the door into the paddock on the same side as access to the loafing area. The nice thing about waiting is now you know what you want/need and what will work for you. Good luck, looking forward to seeing a new barn in your future. So exciting to see how your plans are developing :) And I think you had it right, to use what was there first, to see how it would/wouldn't work for you. Oh, that will be exciting to see. I hope you get to build it. We have a shelter for the girls, a shelter for the boys, and I milk in the "garage". There were no structures on the property (other than the house) when we got here, so we built quite a few. One day we'll build a milk house--a little one. Having everything in one structure would be a dream! Love the layout. Looking forward to watching the progress of it being built. Sue, the figuring out part seems to be inherent to having livestock! Sounds like you've done well with your make-do situation. I've seen a few other outdoor milking arrangements, and I always wonder what they do when it's pouring rain. If Dan ever gets done around here, I'll send him for a visit! TL, that sounds like a lovely arrangement. It's true about waiting. I find I have to live with a situation awhile to figure out what to do with it. That's why we waited so long to renovate our kitchen! Jocelyn, I hope so too. Or at least build it before we're too old and grey to enjoy it, LOL. DFW, thanks! The first step is moving everything out of the existing building, but the problem is where to put it! That's a lot to ponder. Perhaps you could look around to recycle someone else's old barn. Just an idea. I'm sure that you'll recycle all the usable parts of the old building. Hope it all goes well and that no one gets hurt in the process. I used to jump without thinking about how I really wanted things to look. Now, at the current house, we have taken our time, and are still figuring and tweaking things here and there. Barns have been our conversations, too. We have a stable that we bought thinking it would do the job. It doesn't. I had a milking parlor made from one stall and we too two stalls to combine for a birthing tall, but it isn't enough, as we use it for hay instead. The remaining four stalls are for the does, but it does get crowded. Your plan is well-thought out and very good utilization of the space and your needs. I particularly like the drop down for the hay! That is the worst job when they are hungry! Are you thinking of adding more goats? Great looking plans Leigh. Will you and Dan be building the barn yourselves? Renee, that would be a good idea if there were old barns around here in good condition. Most of them are worse than ours, LOL. Everyone puts up metal nowadays. Jaclyn, it's a valuable thing to learn, isn't it? Your prayers are appreciated. 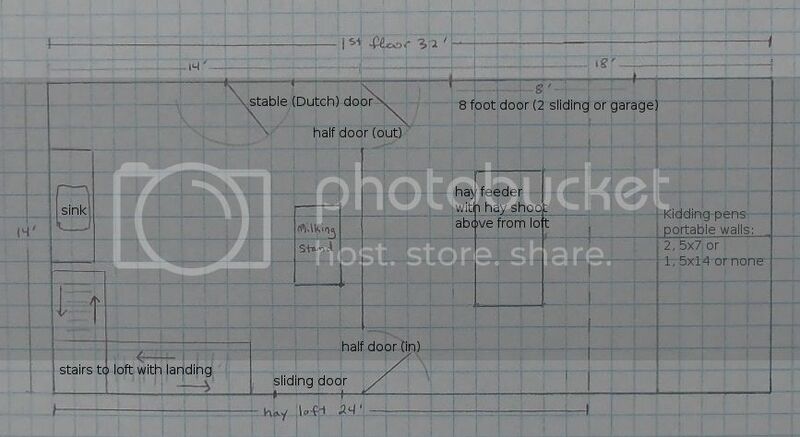 The hay shoot comes from old barn plans. Forking down hay from the hay loft was pretty common at one time. No plans for more goats, necessarily. We just need to be able to accommodate the annual crop of kids. Sandy, thanks! We will build it ourselves. Cost for labor is prohibitive for one thing. Also, we do everything on a pay as we go basis, i.e. as we can afford. Makes for slow progress rather than a steady job for someone. I like the sketches of your barn plans. I also remember dreaming of the day when I would get a barn or coop... You've done so much already and I always enjoy seeing what's happening on your homestead. Sorry, L, I have been off the radar. I have had company. The most important lesson of making do is often what NOT to do. That cannot be undervalued. 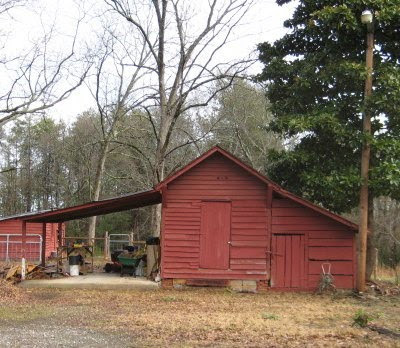 Traditional barns were made when it wasn't nearly as costly to put them up. I LOVE a hay chute. I went to a very fancy former horse barn that had horses who, individually, cost more than my house. They had a nice sloped floor to aid in pushing the hay to the chute. There was an ironwork gate that pivoted to allow the bale underneath without the hay pitcher going with it. Unlimited budgets! The key is also to make sure you keep drafting and re-drafting until you love it. Then, make sure you build in flexibility. Things like an electrical conduit up a wall could be really helpful later. I have piping for a future outdoor urinal just waiting for the day when I can get a little structure up to shield it. The bathroom was in construction so adding the pipes THEN was only a few pennies. Hooking them up later, not so much! Barb, good to hear from you! Summer is a tough time for blogging. Either company or travel. It's taken us four years to even be able to visualize a barn. I didn't mention electricity and water, but those are in the plan too. We are going to add rain catchment, but having a faucet off the barn will be a real boon! Interesting you mention the outdoor urinal. Dan would like to add an outdoor composting toilet (AKA outhouse ;). Someday.